I think you’ll agree with me when I say: Finding the best laser level isn’t easy. Not only do you have to keep your budget in consideration, but you also have to choose between different types of laser levels. Then come other factors including laser level’s accuracy, the color of its beam, its brightness and visibility range among others. Thinking about an easy alternative? Fortunately for you, we’ll provide you with just that. Just go through this article, and you’ll have the best laser level for your needs. In this section, we’re going to show you four products from the first category. Of all the line lasers that you’ll see in this review, the DeWalt DW088K is by far the best. That means it has everything you might look for in a line laser level. Apart from its rugged design, a long warranty and brilliant user reviews, there are four features of this model which we specifically found endearing. this model casts a line at a distance of up to 100 feet (165 feet with laser detector) , which is a rarity among line lasers. Equally important is the fact that this model can cast horizontal and vertical lines at the same time. So you can create a cross-line laser with it. The accuracy of this laser level is ±¼″ per 100′ or ±1/8″ per 30′. Secondly, thanks to an internal pendulum – which helps the level ascertain level lines and true plumb, this unit is remarkably accurate up to 4°. What’s more, if the level goes out of the self-leveling range, the lasers start to blink repeatedly. This indicates that you need to adjust the level. An integrated magnetic swivel – which projects the line by attaching the level to a metal surface – rules out any chances of the level coming off the surface and getting broken. Similar protection is afforded to the pendulum which is encapsulated in an over-molded housing. Thirdly, in case you want your model to last ages, this extremely durable tool will do just that. That is, because, it has a durable plastic and rugged rubber body which can take wear and tear without breaking a sweat. This model has IP54 resistance. Finally, since this model runs on three AA batteries – which are included in the package – questions are to be raised regarding its battery timing. Fortunately, by offering 15-20 hours in one charge, this model answers all those questions with aplomb. The package includes: DW088K laser level, 3 AA batteries, kit, ceiling mount. You can’t lock into a SET position. Despite costing 3 times less than our favorite DeWalt DW088K, the Hammerhead still offers a plethora of useful features. However, we would be lying if we say that its meager price tag hasn’t taken away some high-end features from this model. This is why we have listed this as the best budget friendly line laser level. Granted, this model’s dirt-cheap price tag has robbed it off some high-end features. However, provided you need a level for indoor only, you won’t be able to find many faults in this model. Portability is undoubtedly the best feature as far as the Hammerhead is concerned. This model is so compact that you can fit it in your front pocket while moving around the house. 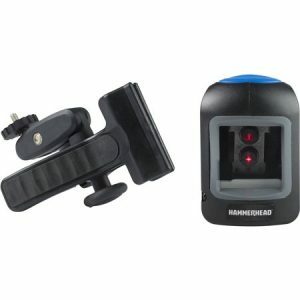 Add to this its under $50 price tag, and you can clearly see why the Hammerhead is such a popular indoor laser level. Even though it has a small size, the Hammerhead offers a considerable projecting distance of around 30 feet with accuracy of ±¼″ per 30′. Such a range means that you can use this level to do small-home projects. 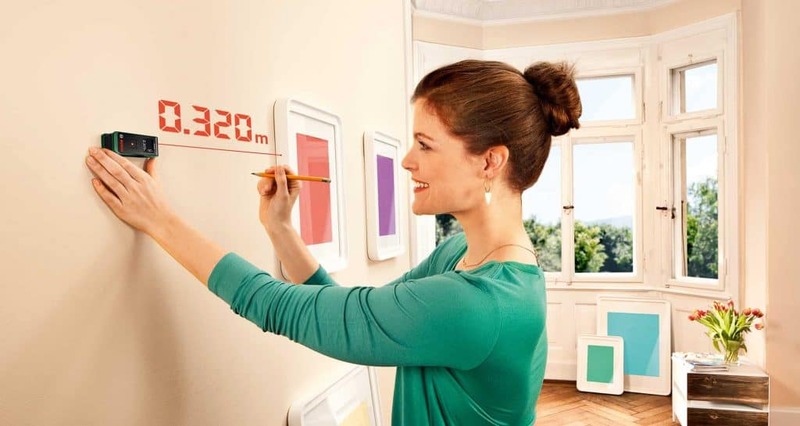 For instance, you can use it to hang pictures, install mirrors and create tape lines while painting surfaces. Furthermore, this self-leveling laser level has an internal pendulum to make a perfect plumb or level line. Due to this, even if you place the tool 4 degrees out of line, the pendulum would automatically adjust the difference. Also, when you set this laser level, it would take almost five seconds to get into position. During this time, the unit ensures that it is placed within the adjustable 4-degree range, failing which an LED – which is located at the unit’s top – starts to flash, hence telling you to adjust it manually. That doesn’t mean, however, that you cannot project a line out of level with this unit. Instead, provided you want to do that, just lock the unit’s pendulum in place to cast your line out of level. Finally, you’d need two AA batteries to run this model, which would provide it with a runtime of 5 hours on a single charge. The level also provides an adjustable clamp in its package, which lets you use a ¼’’ tripod threading to attach it to the tool. Package Includes: 1 Laser level, 2 AA batteries, 1 Mounting clamp. Surprisingly, it comes with manual locking option which is missing in above DeWalt DW088K. Doesn’t have any IP rating, so prone to dust & water damage. You can’t use it upside down. 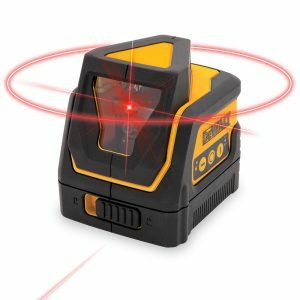 What do you think makes a laser level best? You guessed it; its above-average projection range. However, while it does have a huge projection range, the Craftsman 48250 has other tricks up its sleeve as well. First thing first, the one feature which defines the Craftsman 48250 – and makes it a must-have – is its projection range. It projects its red beam to a distance of up to 100 feet with an accuracy of ±¼″ per 30′. In case you are wondering, having such a long range doesn’t mean that this tool isn’t precise. Instead, thanks to its dual-beam design, the accuracy, and visibility of the model remain the same regardless of distance. That means that you can view even the farthest objects with remarkable clarity. What’s more, if you bump or move the tool out of its level, it won’t stay silent. Instead, before self-leveling on its own – a process which takes about 5 seconds, it would emit a loud out-of-level indicator. In this way, it makes sure that you know about the problem. Furthermore, you can use this tool to project both horizontal and vertical lines. What’s more, it even gives you the freedom to project the lines individually or together. You can even move its line within a 110-degree range, which means it can easily cover an entire room. More importantly, to let you quickly adjust its level, this unit comes with a base mount. Apart from offering strong magnets – using which you can attach the level onto the metal surface, the base mount also offers a standard camera-tripod connection. And guess what? The base mount’s accessory list includes two more items. The first of those is the pushpins using which you can attach the level to a drywall. Next, we have the side adhesives which allow the installation of the unit to other surfaces. Craftsman 48250 runs with 3 AA batteries with a run time of 20 hours. Rugged design can withstand 10 metre fall. Doesn’t have any IP rating. Want to get your hands on a model that is handy, affordable, and durable? Want it to be super-accurate as well? In case your answer to both these questions is in the affirmative, you cannot miss the Tacklife SC-L01 laser level. 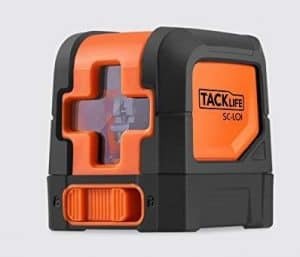 What is it that makes the Tacklife SC-L01 so accurate? The answer to this question lies in the unit’s smart pendulum leveling system. This makes it auto-level when placed within 4 degree of vertical/ horizontal range. Place the unit outside of this range, and the beam will keep on blinking until you bring it back into range. And it lets you know that it’s in range by displaying a solid red cross on the target. 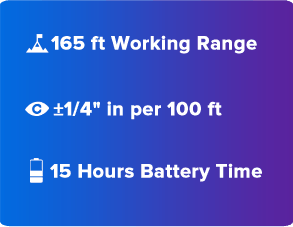 The projection range of this unit is 50 feet and 115 feet with detector.This device’s accuracy remains within ± 1/8″ at 30 Ft. Equally important is the ruggedness of this model which all but guarantees its long shelf life. For, not only is the Tacklife dustproof and waterproof, but it is shockproof as well. It has a IP54 rating. That means you can work with it on a wide variety of DIY projects without any fear. One feature of this model which we found particularly interesting is its ease-of-mounting. On its bottom is a thread which easily attaches the unit to almost all commonly available tripods. Or, if you want to cling it to a metal, the device also provides you with a strong magnetic mount. Turning our attention towards the battery timing of this model, and once again it doesn’t fail to impress. For, it provides a nice battery timing of 12 hours. That means you can easily carry out a full-fledged project in one charge The device uses 2 AA batteries. Finally, looking at the warranty period that this model comes with, and it comes with a 2-year warranty. Granted, it is nothing spectacular – as most models offer such a warranty period – but you cannot call it below-average either. With the support of a tripod, you can use this in 360 degrees as well. This is not for big projects. Thanks to their ability to cast light in a 360° circle, rotary levels can be aimed both vertically and horizontally. As a result, you can use them to install kitchen cabinets, put up shelves, level a floor, among other things. They often called as 360° laser level. In addition to coming with an optional remote – a rarity among any type of laser levels – this model offers both vertical and horizontal applications. Does it deserve your money? Let’s find out. Did we tell you earlier that this model comes with a massive range of 1650 feet? Here’s some more good news; despite boosting such mammoth range, it won’t falter on accuracy either. For, it has a self-leveling pendulum which provides this unit with an accuracy of 3/32’’ per 100 feet. The self-eveling range is ±5º. Supplementing the self-leveling feature of this model is its HI (height of instrument) capability. This function will notify you in case of disturbance with the laser. It is an important feature because, in the absence of warning, you might never know that the level is making wrong calculations. What’s more, it has an easy-to-read LED receiver which gives a digital readout of elevation. That means you can rely on it to check the amount you are off grade. Furthermore, its alkaline batteries provide 90-hour runtime and with rechargeable batteries, it will run for 45 hours. Lastly, to justify the astronomically high price tag of this model, its manufacturer has included an extensive number of attachments in the package. 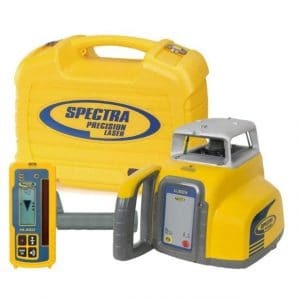 Apart from the unit itself, its package includes a carrying case, Spectra Precision HR320 detector w/bracket,, mounting bracket, and batteries. You even get a mouth-watering 5-year warranty on this model. For those of you who want the performance of a line level and the flexibility of rotary level in one laser, the DeWalt DW0811 grants your wish. This is actually a line laser but simulates the operation of a rotary laser with its 360 degree ability. First thing first, the DW0811 is a cube-shaped device which weighs 4 pounds and runs on 3 AAA batteries. Provided you use this model in the pulse mode, its visibility could go all the way up to 165 feet with a laser detector. It also has a locking button which seals the pendulum to prevent it from getting damaged. The self-leveling range is +/-4°. One particular feature of this model which really impressed us was its controls. All three buttons have three different settings level; 360 degree (rotary), and Horizontal plumb and Vertical Plumb– hence making them ridiculously easy to use. What’s more, all three settings are self-leveling. 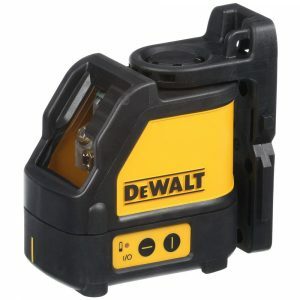 Turning our attention to its line visibility, and DeWalt claims that the rotary mode has a range of 30 feet. Other two modes – horizontal plumb, vertical plumb – can extend up to 165 feet. 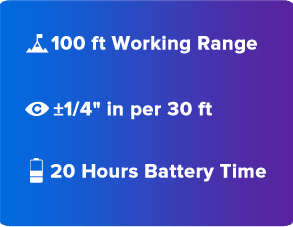 Add to the equation the full-time pulse mode, and you’d have better line illuminance and visibility. Though not as famous as some of the other features of this model, its full-time pulse mode is equally important. For, it allows you to use the level with a detector, while also maintaining full brightness to let you use the level even in high light conditions. Finally, looking at the attachments which accompany the model, and our favorite is the carry case. Not only is its outer body rugged, but the case also has a strong metal clasp. So, the carry case will easily keep the level secure. Not for long range outdoor use. 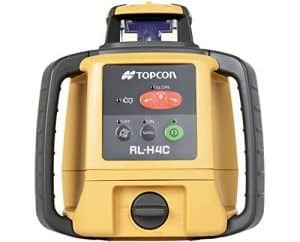 As suggested by the IP66 rating of this model – which is the best of any unit in this review – the Topcon RL-H4C sets the bar high for its competitors. 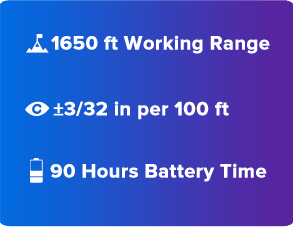 To know more about its performance, let’s look at its features. 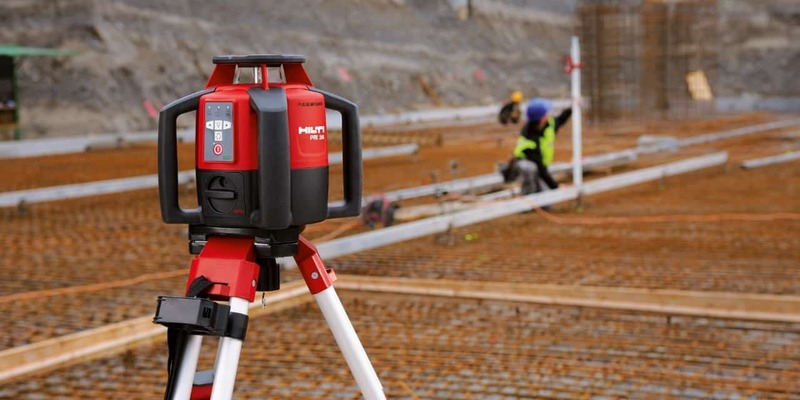 Even for a high-end laser level, the Topcon RL-H4C still has too many useful features. Take the example of its self-leveling motor, for instance. It makes the unit a cinch to set up by taking just 15-seconds to get it close to horizontal. The accuracy and the range of this unit are impressive too. For, its accuracy is 1/16’’ per 100 feet and its receiver gives the unit a mammoth range of 2,600 feet. It has Self-leveling (±5°) range with automatic shutoff. Looking at the receiver, and one thing which you’d find unique is that it has two LCD screens. While one of those LCDs is on the front, the other is on the rear of the model. The transmitter, meanwhile, shows its utility for outdoor applications with its IP66 rating. In addition, an automatic height alert feature is also provided on the receiver. As suggested by its very name, this feature will let you know when the receiver and the transmitter aren’t at the same height. Then comes the slope matching feature which extends custom grades of this unit across long distances. Finally, even though we’d have liked this unit to support rechargeable batteries, the fact that even its disposable batteries can provide a runtime of more than 100 hours means we’ll have to make do with them. In contrast to most other levels in this review – which come standalone – the GRL400HCK comes in a kit. That means that while you’ll be paying more up front, you’ll also be getting more items in return. The Bosch GRL400HCK enamors its users by offering three rotation speeds – 350, 600, and 1200 RPM – in the package. Thanks to this feature, not only has this unit become versatile but its accuracy has significantly improved as well. It comes with Self-Leveling, Up to 5°. Its leveling system, meanwhile, features a patented dual-laser system for both horizontal and vertical leveling. You can use both the vertical and horizontal beams simultaneously for better accuracy. What’s more, you can control everything by a remote which has a range of around 500 feet. Two features of this model make it particularly rugged; its durable rotary cage and multiple thin struts. Thanks to the former, the rotary’s head will be protected even when it is dropped. The latter, by eliminating the blind spots in its design, helps maintain the unit’s strength. Moving on, since this unit’s battery has a runtime of 40 hours, you can at least use it for two days before recharging. Next comes its standby mode which allows you to pause the laser while transitioning it from vertical to horizontal, or vice versa. Want to manage all your plumbing, alignment and leveling needs using a single tool? The best dot laser levels will help you achieve just that. 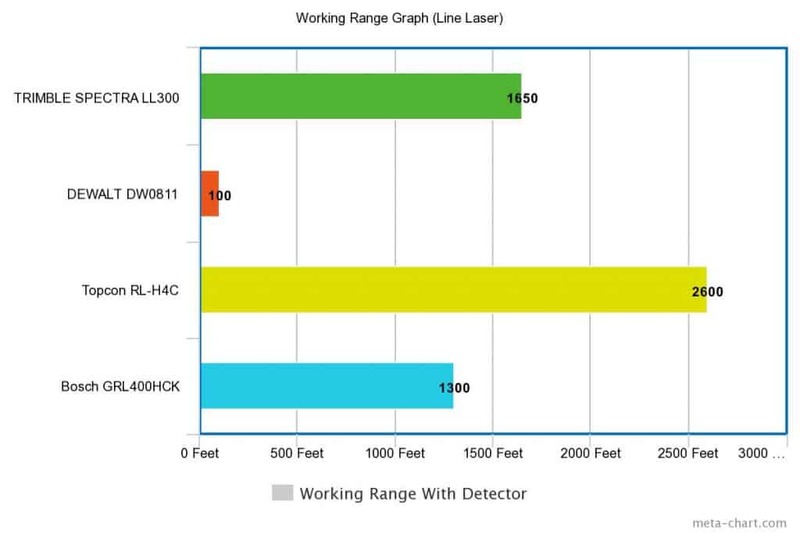 As was the case with line laser levels, DeWalt once again leads the line when it comes to dot laser levels as well. However, in case you have doubts, rest assured that it wasn’t the brand name but the performance of this model which led to its inclusion in this review. What is it that makes the DeWalt DW083K the best? For starters, it is a self-leveling mechanism. Thanks to this feature, this model provides an accuracy of ±1/4’’ per 100 feet, which is the maximum projection range of this model. Also, in contrast to some cheap laser levels out there, the dot size of this model won’t increase with distance. That is, because, it has a focused laser beam which, in turn, keeps the dot size small over longer distances. So that you’d have improved accuracy and visibility regardless of the distance. Equally important is the ease with which you can mount this unit. It has a built-in magnetic pivoting bracket which attaches to the metal surface and therefore makes mounting a cinch. And if you want to mount this unit on a wall, its bottom thread will come to your rescue. As for the durability of this model, two features deserve a mention, the first of which is its single-lever power switch by locking the pendulum in its off position – so that it doesn’t come crashing down, the switch protects it from getting damaged. Secondly, IP54 rating of this model makes the unit water and dustproof. 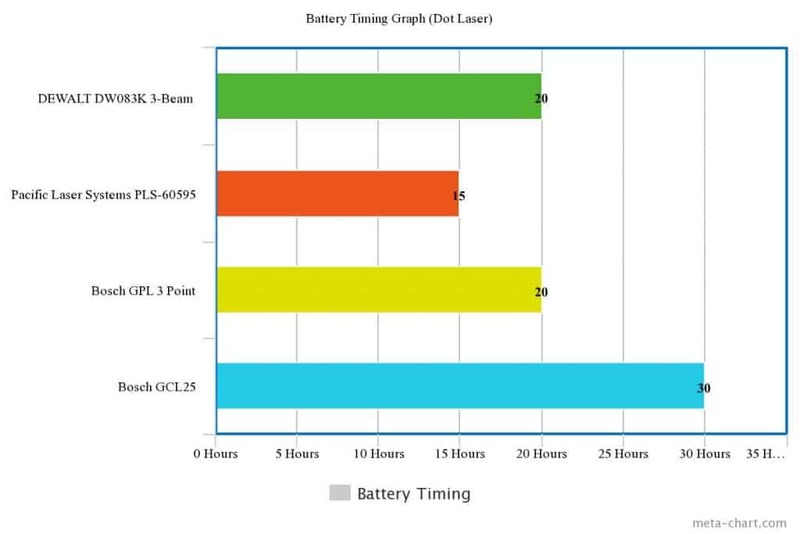 Finally, the 4 batteries which this model requires for operation give the unit a respectable 20-hour battery timing. What makes the PLS-60595 best for outdoor applications – apart from its ruggedness – is its high-focused green beam. Its manufacturer is of the opinion that the green beam is 300% brighter than its red counterpart. Going one step ahead of their competitors, Pacific Laser Systems have proved the ruggedness of this model by successfully carrying on it the 1-meter drop test. That’s right; even after being dropped from 12 feet – the same height as a normal room’s ceiling – this product was literally unharmed. The PLS-60595 has a visibility range of over 100 feet with an accuracy of ±1/4’’ per 100 feet. Ease of mounting is another area where this unit leaves its competitors behind. It has a built-in magnetic wall bracket which lets you install the unit on metal surfaces. Conversely, if you want to mount it on walls, the unit’s floor stand will certainly help you out. Looking ahead, and you’d have no problem tracing the dot, even when projected at its maximum distance. That is, because, it forms a 3-point dot at the target which is a cinch to locate. The accuracy of the dot is further supplemented by the self-leveling gimbal which gives accurate reference points. Furthermore, this unit has a self-level range of ±6*. 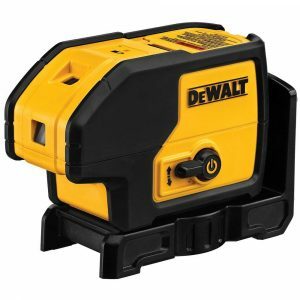 Compare it with other models – like the above mentioned DeWalt – and you’d note the significance of this range. For, it is at least 2* more than most other products in this review. Lastly, to allay any fears that you’ve about the durability of this model, it comes with a 3-year warranty. Of all the laser level manufacturers out there, Bosch laser level is undoubtedly the oldest. That factor alone should convince you to cast a favorable glance at this model. At the cost of sounding too technical, the GPL3 uses plumb and level point projection to increase its accuracy. Without delving too much into what these terms mean, here’s what they do: provide this model with an accuracy of +/- ¼’’ per 100 feet. 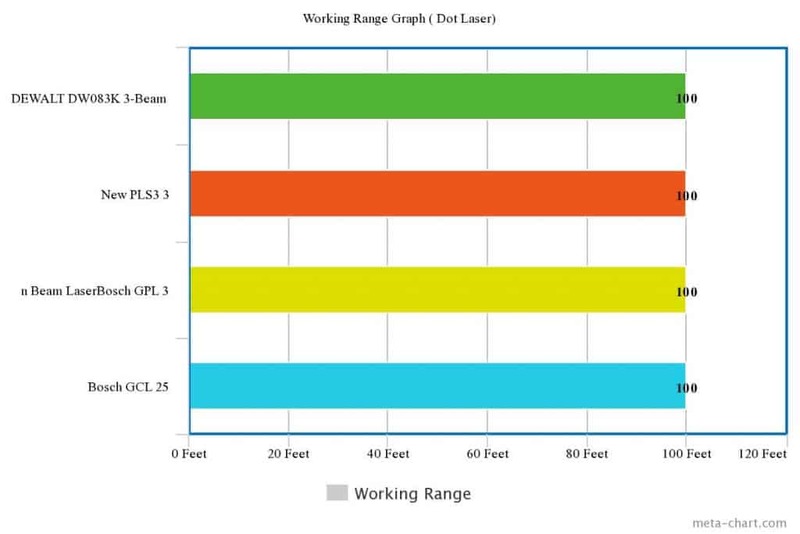 Another feature of the GPL3 which separates it from other dot lasers is its Patented Diamond-Cut Beam Splitter. This mechanism makes sure that a single diode projects all 3 laser points. Consequently, with everything in control of a single diode, accuracy and precision are guaranteed. Next comes the smart pendulum system of this model, which performs three much-needed functions. First, it aligns the laser levels for better accuracy. Second, it gives off a warning sound when the laser goes out-of-level. And finally, it locks the pendulum when the unit is switched off to prevent it from getting damaged. Moving on, making this unit ultra-portable is its sleek dimensions. It measures only 105mm tall and will fit easily in your tool belt. Add to this its meager weight of almost 2 pounds, and this unit becomes a cinch to carry. Finally, in case you are thinking that its compact dimensions have made this product prone to damage, you don’t have to worry. For, it has a robust over-molded housing which makes the unit both water as well as dustproof. 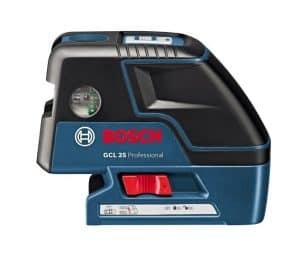 For those of you who are looking for a budget model – but still want it to have all the bells and whistles – the Bosch GCL25 should get your nod. Why? Because it offers four different modes and is very inexpensive than some other dot laser levels. The first feature of the Bosch GCL25 which deserves your admiration is its 5-point laser and cross line. 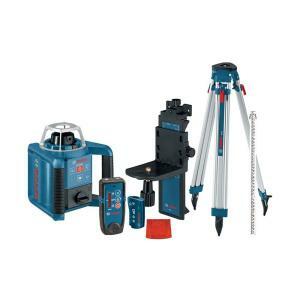 Both these features combine to give horizontal and vertical leveling, plumb transfer and squaring. Also, with two lasers in place of one, you can save both your time as well as money completing projects. Turning our attention to its accuracy, and accuracies for both lasers are different. For instance, while the accuracy is 1/8 of an inch for cross-line, it is ¼ of an inch for points. The projection range is the same for both of them at 100 feet. Also, the Bosch GCL25 has a one-button operation. Using the same button you can switch between the four self-leveling modes. These modes provide a leveling range of 4* and take around 4 seconds to level. And in situations where automatic leveling isn’t possible, the unit lets you switch to manual mode. 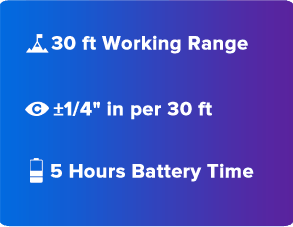 As for the battery timing of this model, there are three of them; 12 hours for cross and point line operation, 20 hours for 5-point mode and 30 hours for line use. Also on offer is a battery indicator which will flash 3 times when the battery is low. Finally, one of the reasons why the unit last longer is because of its automatic shut-off function. It kicks off when you haven’t pushed a button for 30 seconds, putting the unit to sleep. Just like everything else in life, laser levels do not come in the one-size-fits-all category. Instead, they are divided into types on the basis of various factors. Consequently, unless you don’t know all the types of laser levels, you won’t be able to select the best one for you. One of the most common laser levels, a line laser casts an accurate vertical or horizontal line onto the targeted surface. It provides two types of projections; a 360* projection and a forward projection. You can observe their difference by projecting a line using each on one wall. While the forward projection would only give a line on one wall, the 360* would do the same on all four walls of your room. This can be used by builders for construction works. Applications: Indoor House Fixing, Leveling of building sites, 3D scanning, Surveying. As suggested by its name, the dot laser level casts a dot of light on the targeting surface. The dot can be level, plumb or square shaped. You can use them to make sure that your wall and/or the pipes traveling from roof to floor are plumb. Applications: Plumbing Installation, Electrical Work, Framing Applications, HVAC. Rotary Level Lasers Though not as common as line lasers, rotary lasers are equally efficient. They project the line in a rotary fashion and are usually on the bigger side. They come in two types: dual-slope and single slope. While the former type move line across both the X and Y axis, the latter projects it only along the Y axis. You can use X mode for aligning metal tracks and Y mode for setting pitch on your driveway or setting slope. As they say that it’s better to measure twice and cut once, it won’t hurt to check your laser level before buying it. Otherwise, no one might save you from the sheer embarrassment of a badly-leveled project. There are many factors which separate the best laser levels from the riff-raff. Let’s take a brief look at each of them. 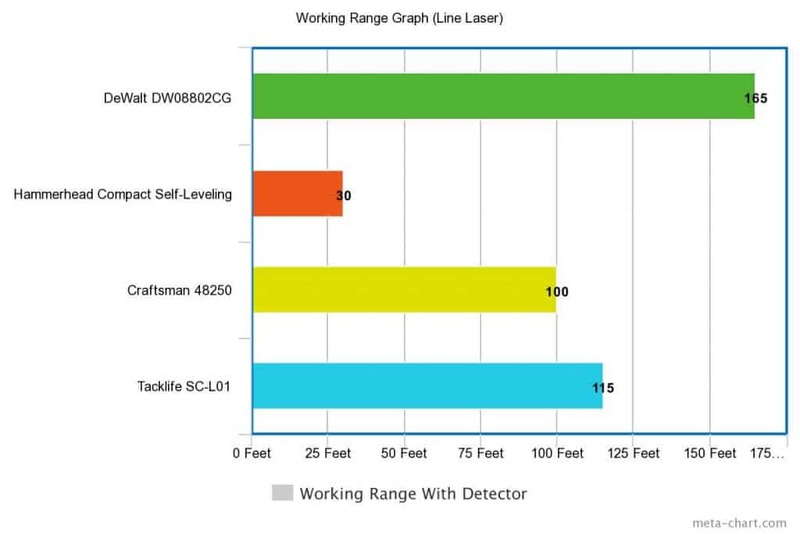 Most laser levels nowadays offer two types of accuracy levels: self-leveling and preset. We recommend the former for the simple reason that they automatically find their true level. That is, because, they have an inner pendulum which lets the level find its best accuracy. However, while self-leveling models are the best, they are also expensive. Therefore, if you cannot afford them, there’s no harm in going for preset models. Make sure, however, that the present model you’re going for should have a rating of at least +- 3Xm. Ask users of laser levelers, and you’d see their opinion is divided when it comes to laser colors. While some of them would vouch for red beams, others tell you to go for a green beam laser. So, the question arises, which of them should you trust? Both, for both these color beams, have their specific advantages. Red beams, for instance, consume less power and are sufficient for almost all indoor tasks. Green beams, on the other hand, provide up to 300 times more power, which makes them ideal for heavy-duty jobs. Therefore, if your work involves indoor tasks, a red beam will be more than sufficient for you. Conversely, if you want to do some high-end stuff, green beams deserve your attention. 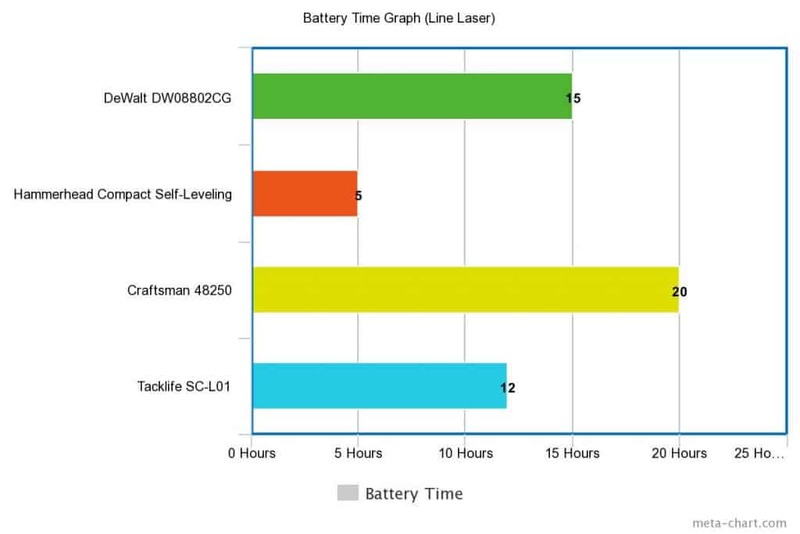 When looking at your laser level’s battery, check its runtime, life cycle, Amp-hour rating, and Voltage. Run-time, as you might guess, is the time battery will last on one charge. Some models offer as much as 30 hours of runtime. As for the life cycle, it determines how many times you can recharge the battery before it goes bust. So, the greater the life cycle, the more rechargeable your battery will be. 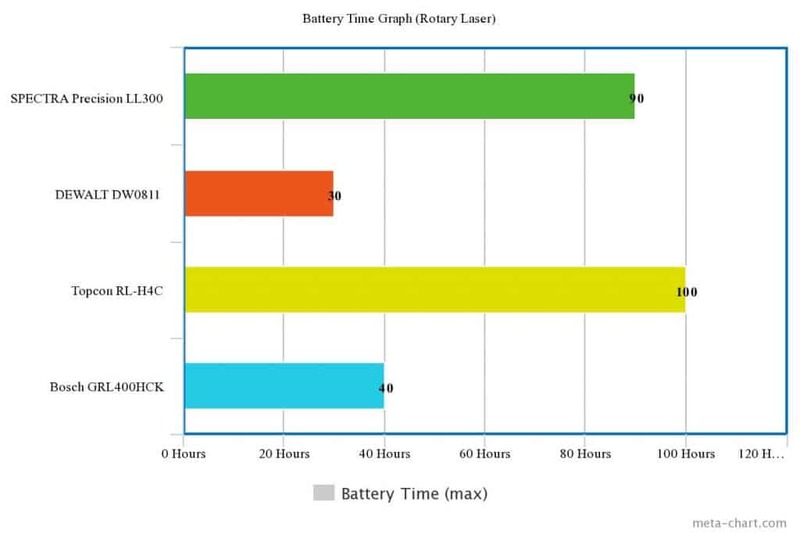 Next comes Amp-hour rating; which determines how much time the battery will last. Finally, we have the voltage, which determines the working output (or power) of the level. That means that if your battery provides more voltage, its beam will be brighter. 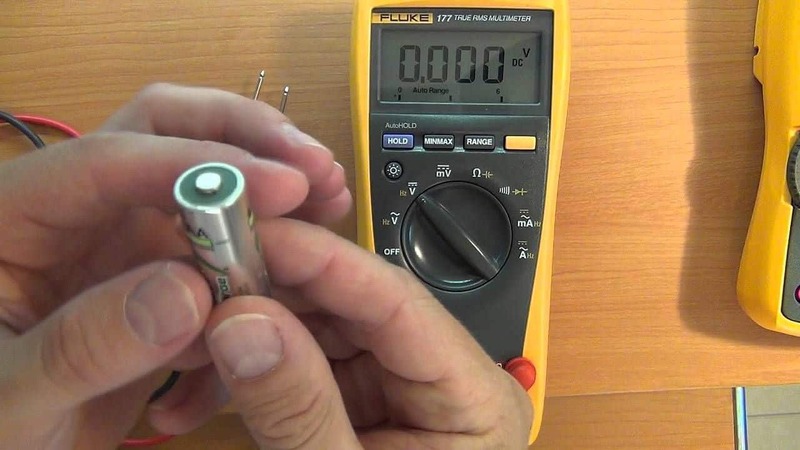 However, in contrast to what some people believe, the voltage has no effect on the range of the tool. Regardless of which laser level you choose, it will have some pretty big differences in its operation from the next model. While some lasers have one or two buttons, others – which are more advanced – require you to configure their settings every time before using them. Therefore, when selecting the best laser level, make sure it has as few buttons as possible. This way, you’d have less to remember. However, having a few buttons doesn’t mean that you should compromise on the functionality of the model. As veteran laser users might tell, these are two different types of lasers. And their utility (or lack of it) depends on where you intend to use them. For instance, if your work involves floor leveling, a horizontal laser will let you easily locate the inherent irregularities. Dual beam lasers, despite being more expensive, also offer specific benefits. By providing two beams simultaneously – one of which is horizontal and the other vertical – they are suitable for projects which involve large partitions and wall fixtures. You can also use them for installing cabinetry. A common feature among best laser levels nowadays, it automatically sets up your tool within its leveling range (generally ± 5*). It does the same thanks to the compensator which keeps the line of sight of the tool always horizontal. That means even when the laser unit won’t be level, its line of sight will be. Want your laser level to last for a long time? Of course, you do, and that’s also the reason we recommend a vast temperature range. For, tools which offer this feature can handle more extreme conditions with ease. Want to mount your level in both indoor and outdoor settings? Then you must make sure it has multiple mounting threads. For, using these threads, you can mount your device on different types of surfaces such as rails or walls. There are some levels which also give the option to mount them on a tripod. Short form of Ingress Protection Rating, an IP rating tells the degree of protection the tool will provide against the intrusion of dust and water. As you might guess, higher IP Rated products are more durable. However, if you’re only going to use your laser level for indoor projects, you can ignore their IP rating. If one person is going to perform the task alone, having laser levels with remote control capability might prove to be a godsend. Though you might want to note that remote controls vary in their range. For instance, even the best remote controls have a range not more than half of the tool’s operating distance. Especially if you’re going to choose a battery-operated model, make sure it comes with a power level. These are three small lights located on the unit and tell you the remaining battery timing. So, if your unit has them, you’d know in advance when to recharge it. As for the warning level, it will let you know when something is wrong with the product. While some units display an audio warning sign but do nothing, others shut down the unit when they encounter something amiss. 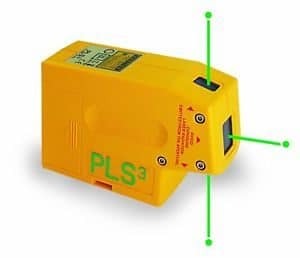 A laser level is mostly used by construction workers who project its green or red beam onto a flat surface to measure its levelness. While small laser levels can be used in homes for DIY projects, their bigger counterparts prove useful at outdoor and construction sites. Furthermore, if you are building a home, having a laser level would let you check whether the roof and/or ceiling is flat or not. Similarly, if you’re moving around furniture, you can make sure it is placed on a flat surface using a laser level. 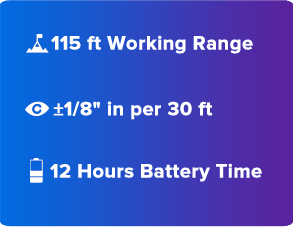 For your convenience, we’ve categorized the best laser levels into three types: line, dot, and rotary. Q: Which is the best line laser level for indoors? A: Thanks to its vacuum suction, its ability to project around corners, and its ultra-portability, the Ryobi AirGrip ELL1002 is undoubtedly the best line laser level for indoors. 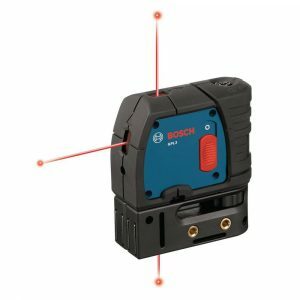 Q: Which is the best line laser level for outdoors? 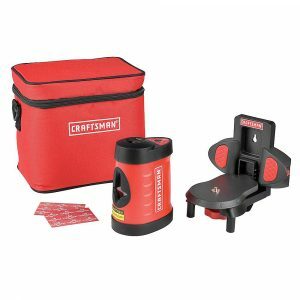 A: The Craftsman 48250 is undoubtedly the best outdoor line laser level. That is, because, it offers a huge projection range, is self-leveling and employs a double beam. Q: Which is the difference between green laser and red laser? A:There are two major differences between green and red laser levels. First, the green laser is 300% brighter than its red counterpart. As a result of this, you can easily see it at a considerable distance. The second difference which stems from the first has to do with power consumption. Since green laser levels shine brighter, they consume more power and have less battery timing that red laser levels. Q: Which is the difference between visibility range and working range of a laser level? A: What differentiates the visibility range from working range is the workability. That is if a laser has a working range of 100 feet – but a visibility range of 500 feet – the latter is of no use to you. So, when checking the specs of a laser level, never check visibility range. Instead, always check the working range. Q: Which is the best dot laser level? A: The DeWalt DW083K is undoubtedly the best dot laser level. Apart from offering integrated magnetic brackets, it has a self-leveling mechanism and built-in track clearance. 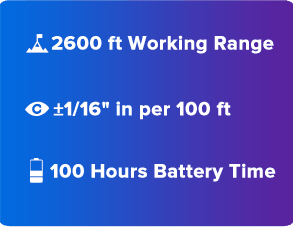 All these features combine to give this unit remarkable accuracy. There you have it; some of the best laser levels money can buy. To make sure you go back from here with your hands full, we have included levels of each type. Therefore, whether you came here looking for dot, line or rotary laser level, we’ve you covered. Still, if you think we missed out on a good product – or included an unworthy one – please let us know using the comments box.